In the initial months and years after my sister Denise died by suicide (just two weeks before her 18th birthday), I sought out as much information on sibling loss as I could. Denise was my younger sister, the one I shared a room with for 10 years, the one who knew more about me and my goals and dreams than anyone else. When she walked in front of a train near our parents’ suburban Chicago home, I was 21 and working on a journalism degree at Ball State University in Indiana. My goal from first grade on was to be a writer. But the loss of my sister, which left my family of six now a family of five, redefined everything I believed in and wanted. In my search to understand my loss, I combed what now seems like mountains of information, looking for other losses similar to mine. What I found was little that defined sibling loss by the mode of death. Some studies confirmed that suicide loss was similar to other sudden deaths (homicide and accidents), yet some books disregarded mode of death. I found it difficult to relate to those who lost siblings by other means, especially illnesses where there was a chance to say goodbye. There was no anticipatory grief in the case of my sister. On the morning of March 18, 1993, I knocked on her door, she mumbled something to me that I could not understand, and I went on my way for that day. By 10 a.m., she had died and I had to spend the following years of my life trying to figure out how to say goodbye to her. Emotions following a sibling death are varied because families are unique, situations are different, our relationships change with our siblings throughout our lives, and because we suffer our losses through multiple types of death. The following is a summary of how mode of death affects some of the emotions grieving siblings might feel. It is important to note that because situations are unique to each relationship, one sibling might not experience exactly that of another. When a self-inflicted death occurs, we often say there is a legacy of suicide left in the family. One suicide in a family puts the others at a greater risk (Jordan, 2001). Suicide becomes part of their normalcy, a part of their lives that it does not for people who have the fortune of never experiencing it. Surviving siblings, especially those who are younger than the one who died, might fear they will also die by suicide, particularly when they reach the age of the one who died. Surviving siblings also worry about the stigma that it will carry and thus they might deny that their brother or sister died by suicide. Not coping, however, will force grief to manifest itself in other ways, usually through physical illnesses. The fear of stigma siblings experience can be particularly stressful as they age and find themselves getting involved in possible long-term relationships. They fear rejection from their future in-laws because they’ve had a suicide (and possibly mental illness that could have contributed to the suicide) in their families. Circumstances of the death might have been kept from the siblings, even older siblings. Usually parents do this to protect their children, not realizing that the children affected must cope with the reality when they find out how their sibling really died. Searching for the answer to why might plague siblings for years. They will wonder if they caused their sibling to take his or her life, what is often called the ”could’ve, would’ve, should’ve” of sibling grief. They might wonder if things they might have said could have changed circumstances, particularly true for younger siblings who may not fully understand death and suicide (Linn-Gust 2001). And they might feel guilty. As guilt is a primary piece of suicide survivorship, it is hard to find survivors who do not experience it after the death of their sibling. They will look back on their times together and remember the difficulties they shared, the typical emotions of growing up in a family, and believe they should have been nicer to their sibling or spent more time with him or her. Finally, blame is another emotion associated with suicide. But with suicide, the blame differs because the deceased sibling took his or her life; there isn’t “something tangible” to blame like an illness or a drunk driver. For surviving siblings, the guilt also might stem from not realizing that their sibling was struggling and feeling bad and that they did not try to help them. Family members will each have a different story of what happened and what led to the person’s death and siblings are no exception to this. Siblings have a different perspective on the suicide because their relationships were different with the deceased person than that of their parents and each other. Siblings need an opportunity to express their emotions following the suicide without their parents because their stories and emotions will be unique. Sudden death has its own issues for surviving siblings. While some of these emotions will be in line with those of suicide, people who experience the death of a sibling by sudden death will be faced with circumstances usually beyond their family’s control. Homicide and accidents can be questionable and lead to lengthy grief because of unresolved cases in the legal system. Siblings might be ready to move on following their brother or sister’s death, but the legal battles and open investigations keep them from moving forward. Sometimes there is no closure for siblings in these types of death. As with suicide, there usually is no time to say goodbye. The death is instant, coming at a time when it’s not expected and under atypical circumstances. Siblings who see their brother or sister die, whether by an accident, homicide or suicide, could suffer post-traumatic stress disorder as they relive the vision of seeing someone they care for very much die in front of them. In some accidents, the siblings might believe they were to blame and suffer long-term complications from grief. Siblings who experience the loss of a brother or sister to illness often have a chance to spend time with them and say goodbye. This experience might seem like it could ease the process because they have an opportunity to express their feelings. However, it also can be difficult because the process can go on for an unknown period of time. Life is disrupted and no one is quite sure when it will be “normal” again. And that normal will be forever changed. For children, it can strain their relationship with their parents because parental attention is devoted to the sick child. Children are forced to live through the sickness of their sibling with worry and sadness because their playmate is no longer available to be with them. Siblings who watch their brothers or sisters die also might have lasting memories of those last scenes of the siblings’ lives (Bank and Kahn, 1997). It might have been traumatic for them to witness their sibling?s death. Or the sibling might have died in a hospital in another city and the sibling is left to imagine what really happened. While sibling grief has many parallels to the loss of a friend or another family member because of the loss of memories and a shared childhood (Cicirelli, 1995), the reaction to the death also will be unique based on the experience of the surviving sibling and the closeness of the relationship. The way that sibling dies will affect the grief experience as well. Thus, when working with sibling survivors, it is important to acknowledge that the sibling’s grief will be complicated by the manner in which the sibling died. Surviving siblings must acknowledge their loss and the manner in which it happened before they can move forward in their lives. They also must be reminded that just because their sibling has died does not mean their sibling is gone from their lives. They do not have to let go of the memories of their deceased sibling. Only through coping with the death will they learn how they can take that person’s memory with them as they continue to move forward in their lives. Bank, S. P., & Kahn, M. D. (1997). The sibling bond (2nd ed.). New York,Basic Books. Cicirelli, V. G. (1995). Sibling relationships across the life span. New York: Plenum. Jordan, J. R. (2001). 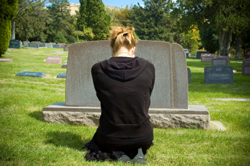 Is suicide bereavement different? A reassessment of the literature. Suicide and Life-Threatening Behavior, 31, 91-102. Linn-Gust, M. (2001). Do they have bad days in heaven? Surviving the suicide loss of a sibling. Atlanta: Bolton Press. Michelle Linn-Gust, Ph.D., Past President of the American Association of Suicidology, has spent the past twenty years educating people worldwide about coping with loss and change following the suicide of her younger sister. Her eighth book, Conversations with the Water: A Memoir of Cultivating Hope, chronicles her grief journey as she moves forward beyond the suicide and loss field. Her first book, based on Denise’s suicide, Do They Have Bad Days in Heaven? Surviving the Suicide Loss of a Sibling, inspired siblings around the world in their survival after a loved one’s suicide. She writes the weekly Good Causes column for The Naperville Sun newspaper and helps people accomplish their goals through her life coaching practice. Learn more about Michelle at www.inspirebymichelle.com.